During the winter months, boots are essential for getting through the season of snow, wind and cold. For fashionable and stylish women, the frigid temps rep another opportunity to show off her style. 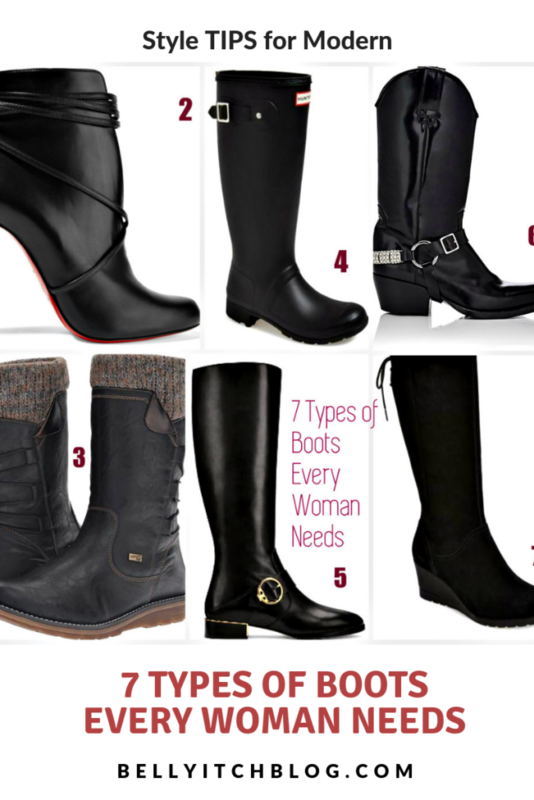 There are essential styles of boots that every woman should own and keep in her winter wardrobe. The over-the-knee boot is edgy but this style of boot is also great for keeping the leg warm while wearing a mini dress or skirt. It usually comes in variety of heel length and in suede or leather. Some are accessorized with functional tie ups or other trinkets for flare. These boots are slimming as well and can be worn in the Fall and Spring as well. A low cut ankle bootie can come in a chunk or stiletto heel and is perfect for wearing with an outfit that is in between classic and feminine. It’s the perfect boot for dressing up a look or rocking during an after work happy hour. For being out-and-about during the weekend, mall trekking or errand running, a good pair of leather rugged boot is a must-have in the winter. Get one with a sweater at the calf to add some sporty yet chic accents. These boots are easy to put on and go and are great for when it is snowing, icy or sleeting out. They also keep the feet super warm. An iconic pair of rain boots is functional to keep the feet dry in rainy days but also are a stand out and known for being stylish, especially the Hunter boot. They are perfect for wearing with jeans and can be slipped on and go! The classic riding boot never goes out of style. They can be dressed up or down, depending on the outfits. They’re not meant for actually riding a horse in but for showing off your sophistication and appreciation for the equestrian look. You can get a pair with buckle or detail zippering to really make it stand out as well. You don’t have to be a cow girl or cow boy to appreciate a good stylish cowboy boot with embroidery and design on the side. These boots are usually always leather and can come with studs or mock spurs for stylish. If one invests in a durable pair, they can last a long time. Just don’t go trying to wrestle real cows in these. Just like with the Riding Boot, the fashion cowboy boot is a version for fashion are not that functional. The wedge boot is a fave for elongating the calf and giving you a little lift. It’s a fave for those 5’4″ or shorter but they are also fabulous and chic as well. The Chelsea boot, known for the town in London where the boots came popular, are usually in a wedge variety though a lot come in a chunk heel as well. They are modern and can be worn to the theater, a concert, outdoor gathering or other event. They too can be dressy casual and dressed down. 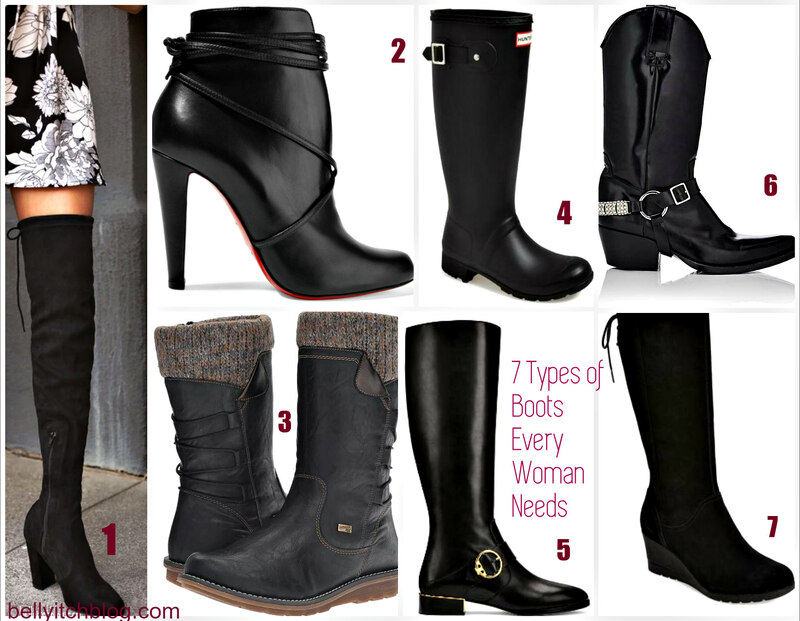 With these 7 boots any woman would be prepared and amply prepped to rock any and all occasions. The daily grind or the occasional high fashion outing — none is out of range. Date nights are made easier too in these fun, stylish, chic and versatile variety of boots!